Last semester I was teaching a History of English module. With little in the way of previous teaching materials, I had considerable scope to develop my own – and woah, did I have fun with that. 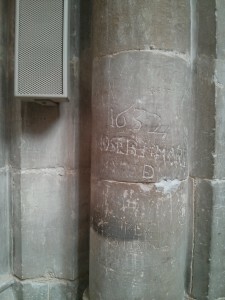 I grew up in a medieval city, its Anglo-Saxon quarters still somewhat in evidence and traces of its inhabitants and their trades and their prejudices echoed still in the street names. The city itself is a palimpsest, post-war layered on Victorian layered on Georgian layered on Tudor layered on medieval layered on Anglo-Saxon and, crouching in alcoves, the city’s old Roman walls. It’s impossible to live there and not let that somehow soak into your bones, just a quiet awareness that your life is one breath against the city’s dreaming stones. And yet, all of this history is just part of your life. When you grow up playing on castle ruins (destroyed in the English Civil War and never rebuilt) and running around a medieval great hall and there are Roman coins on a table in your primary school because they were dug up in someone’s dad’s field, and you spend your teenage years perched on tombs and ruining tourists’ photos by sprawling messily on the market cross, it’s impossible to be too reverent about the history that surrounds you. As a child, I was enchanted by illuminated manuscripts – and also by the graffiti carved into the cathedral stones. History is real people, real lives – not just stuff to distantly admire. I hope that this came across in my teaching as I offered them historical context along with linguistics, information about Anglo-Saxon farming methods taught alongside the case system. I wanted them to understand where these texts came from – the fact that manuscripts were heavily used, the physicality of operating a heavy printing press. Happily, the university has a massive school of art and one of their specialities is various forms of printing, so off we went to operate a letterpress. Our guide to the process, Naomi Midgley, showed us around the typecase, how to set up a composing stick and had prepared a forme of a text for us to print. 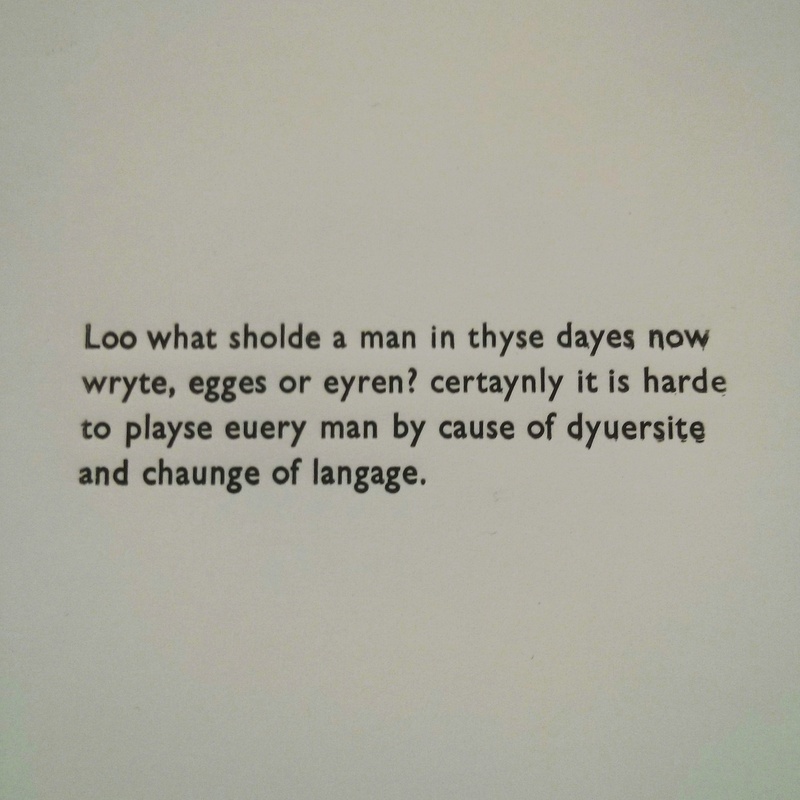 Because I couldn’t resist trolling my students a little bit, I chose a extract of Caxton. Then we got to place the forme in the press, ink it, carefully place a sheet of paper over it, place the tympan and frisket over it, roll the coffin into place, pull the bar towards us to lower the platen then push it to raise it, then roll the coffin back out, lift the tympan and frisket and finally lift the sheet of paper to view the new print. It was an important insight into the physical nature of producing a print and what can go wrong as our inexpert hands applied too much ink, not enough ink, applied too much pressre from the platen, not enough pressure, nudged the paper as we lifted it off and smudged the wet ink. It was one thing to read about the process of producing a printed text; quite another to actually do the labour myself. If I could, I would love to apprentice myself to a printer, to learn how to reach into the the typecase without having to look, to assemble formes, to allow the process of operating a press mark my body with ink and callouses and changed musculature. As a corpus linguist, one of the things I struggle with is the way that materiality is both present and absent in the texts I use. 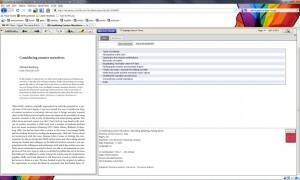 I use large collections of machine-readable texts, stored on my computer or a server and manipulated using a computer program. I don’t go into archives, rarely physically come into contact with my texts. However, they are scanned using Optical Character Recognition and through this, the early twentieth century newspaper texts I use with constantly remind me of their physicality. 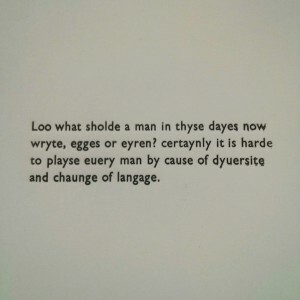 In these texts, flecks of dirt or ink, smudges, imperfections in the paper and so on are interpreted as salient by the OCR program: spots of dirt or ink become full stops or commas or dashes or part of a colon or semi-colon, flecks of ink mean that o acquires a tail and becomes a p or q or b or d, smudges turn a c into an o or an e and so on. In corpus linguistics the text is both isolated from the way it was physically produced, yet the method of production haunts the text, is a ghost (or perhaps a poltergeist) in my analysis. I often had to return to images of the newspaper text to interpret my concordance lines or manually correct texts for detailed analysis. I don’t have an easy answer or, indeed, a conclusion. Perhaps all I can do is suggest what I had to do so many times when the smudges and blobs became too much: return to the text with human senses. This term I’ve been teaching in London. As I still live in Nottingham, this has required me to hoof myself down to London for a 10am class. Thanks to some kind friends who’ve let me stay on their mattresses, airbeds, beanbags and sofas, I’ve managed to all but avoid the expensive 6:30am train (and accompanying horribly early alarm). 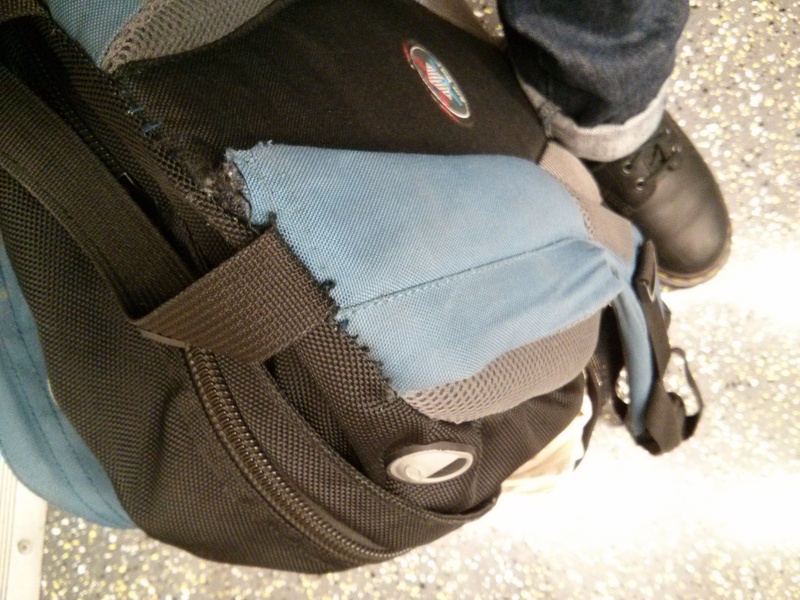 However, I’ve had to carry a lot of stuff around me and it was therefore with dismay that I noticed my faithful rucksack’s shoulderstrap coming off one morning on the tube. I’ve had that rucksack since I started my MA in 2006 and it’s been with me through my MA and PhD, two universities, three departments, trips to India and Egypt, many conferences and numerous visits to friends and family all over the country so I suppose it’s earned its retirement. However, this left me without a rucksack. A friend suggested Osprey and I splurged on the Osprey Momentum 30. This is totally Sam Vimes’ Theory of Economic Injustice – I am hard on my bags, and at the moment I’m being paid. It therefore makes sense to spend money on something that will last (I hope) than buying a cheap bag that will fall apart when I load it up with library books, leak on library books/my laptop or be uncomfortable to carry or cycle with. This review is of an older and slightly bigger model but I was impressed by the thoughtful design and quality. This review and this review are both of the model I went with. 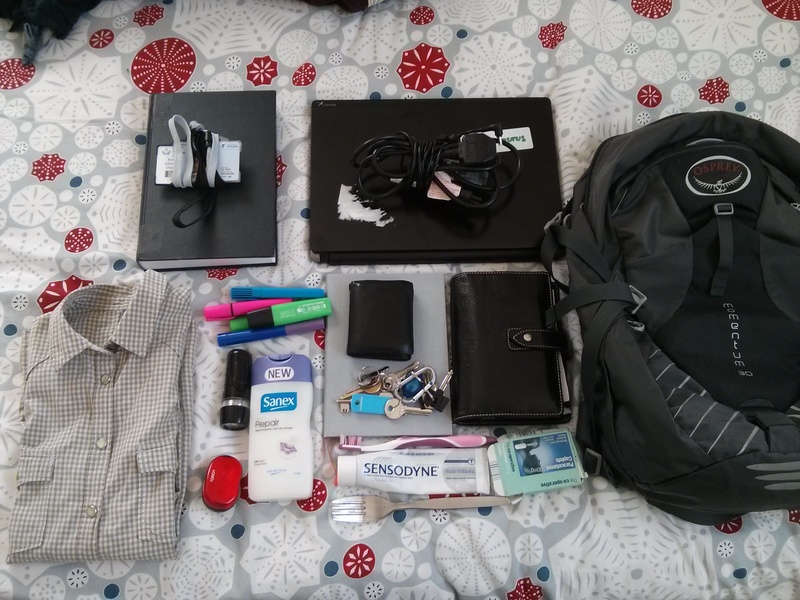 The photo below is of all the stuff I routinely carry with me. Going from left to right we have a hardback book (unusually, only one), my university ID cards, my laptop and charger, a shirt, assorted highlighters, the grey notebook I use to keep my conference notes together, my wallet and keys, my filofax, bike lights, shower soap, toothbrush and toothpaste, forks and paracetamol. I’d usually also have PJ bottoms and underwear with me but you get the idea. The Momentum 30 copes admirably with all this and more – I even got my softbound thesis in there as well as everything else and it was great not to have to lug that around in a carrier bag. The pockets are spacious enough to be useful; I use one of the side pockets as a washbag and can easily fit shower soap, moisturiser and facewash in there. So many pockets means that I can use them for different things and as a result, no one has to know that I’m taking my PJs and toothbrush into work as I won’t accidentally pull them out along with my laptop charger. The small zipped pocket in the main compartment is big enough to fit keys, my wallet, pens and my passport but small enough that these don’t get lost among the other stuff. I live in an area where cycling is an everyday thing. While I’ve seen (and admired) a proper Dutch cargo bike chained up, I’ve seen more bikes with interesting cargo-carrying modifications – shopping baskets are a popular addition or, as in this fine example, a washing up bowl. I’ve not been doing my cycling commute much recently but this bag did very well on a trip to the shops – it comfortably held 4 litres of laundry liquid and fabric conditioner as well as my food shopping. The side straps can be tightened to make the bag more compact and it means you don’t have the bag shifting weight while cycling. The bag can also be used for hand luggage on planes and I easily fitted nearly a week’s worth of clothes as well as laptop, book etc when I visited my partner recently. About the only thing I’m not sold on is the laptop compartment against my back; it’s a bit big for my laptop so more a personal preference than a design flaw. Instead, my laptop goes into the document pocket in the main compartment and I use the laptop compartment to keep shirts flat when travelling. It would also be nice to have some way of tucking loose straps – I’ll probably make some ties or find clips but the lack of these seems odd in an otherwise thoughtfully designed bag. It’s made me think about how things can be so much easier with the right tools and equipment. This term has been stressful enough as it is – among other things, I’ve been working three jobs (four if you count monthly invigilation), organising a module and working out the logistics of travel – and I simply don’t want to have to think about how I’m going to transport my stuff or for how long I can comfortably carry it or the chances of my stuff getting damaged or left behind somewhere. It’s been so nice to have room to keep some things in this bag permanently (and therefore not risk forgetting them) and it’s made my crash course in survival skills for the young academic that much easier. As someone who cares for the environment, is broadly anti-capitalist and is against buying stuff for the sake of it, I am trying to surround myself with things that are good at what they do and which will last. I don’t want to keep having to replace things that wear out too soon – I want to be able to get something and be confident that it will be usable in 10 years or 20 years or longer. Hopefully this bag will be one of them. It pains me slightly that my life has become one where I consider not pulling out a toothbrush in front of my students/colleagues to be a minor triumph, and yet here we are. Recently I was in a cafe with a friend who is just starting her PhD. Talk turned to what we were lugging around in our bags: the usual annotated journal articles, academic books, phone, keys, wallet, railcard, pens, notepads…and my organiser. I’m one of those sad people who still uses a paper organiser. 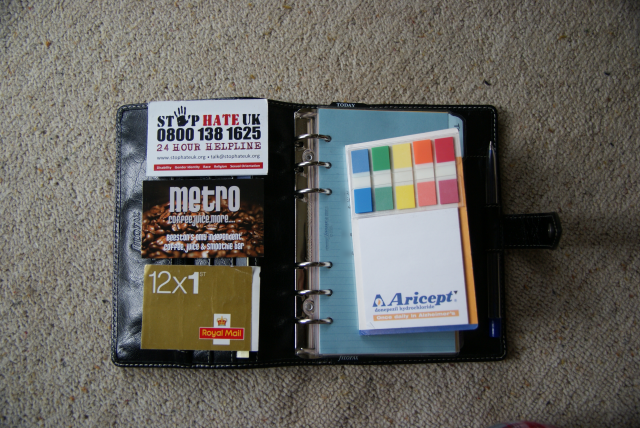 To add to that, it’s also a filofax. I am either so very cool no one else recognises my coolness (yet) or I am just a bit of a loser. I like writing on paper for several reasons. A diary is harder to lose, my style of scribbling in diaries doesn’t lend itself easily to electronic means, I find actually writing something helps me remember it, I like my handwriting and pens and the smooth trail of ink over paper. I don’t like feeling dependent on a phone for all my needs and already feel somewhat over-reliant on it. Laptops are often more cumbersome and heavier than I want to carry around with me all day, a tablet is prohibitively expensive and ultimately, I like having something that doesn’t run on batteries and therefore won’t inconveniently die on me and force me to hunt around for a coffee shop that has a plug point I can borrow. 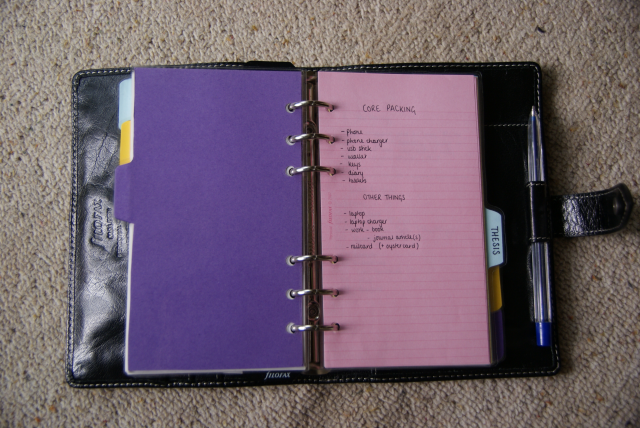 I like using a filofax in particular because of its flexibility. I can add more stuff, shift the diary from a Jan-Dec to a Sept-July format, rearrange bits within it, and create new sections if I need them. 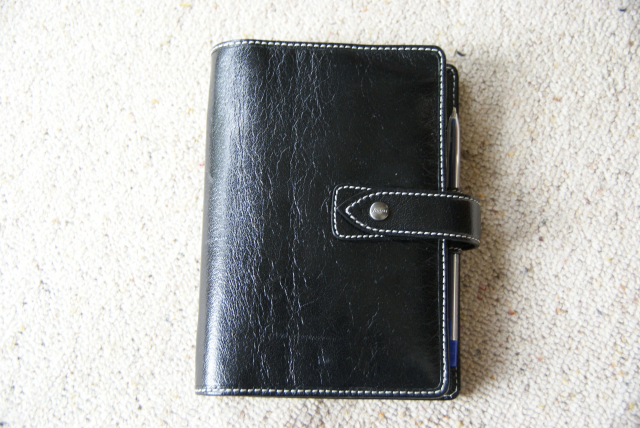 I am also ridiculously fussy about the diaries I use, and when I bought a bound diary each year I would get slightly obsessional about finding exactly the right kind of diary – week to two pages, either faintly ruled or unruled paper, not-hideous fonts, decent quality paper. 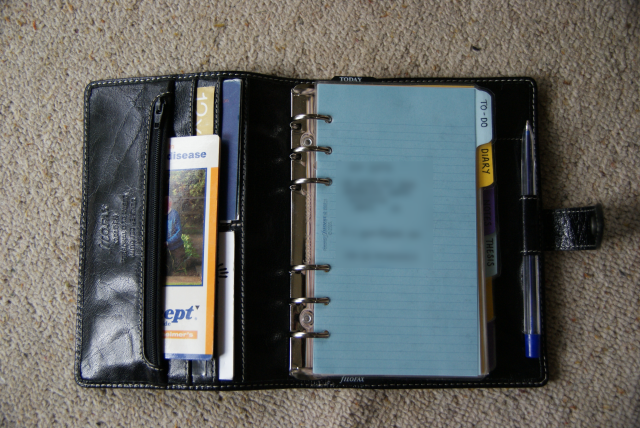 While the filofax diary inserts aren’t perfect they are at least consistent. I live in a household of two medical doctors and two academics so we have a good stash of stationery! Perhaps appropriately (or not at all appropriately, depending on your sense of humour), Aricept is used to slow down the progression of Alzheimer’s disease. And therefore, they give out post-it notes to help doctors remember things (like their brand). I have a front card with my name, permanent address, personal email and phone number. I don’t like the front sheet that comes with filofax organisers as it’s too much detail that I don’t particularly want to share. I made the dividers out of card then laminated them so they’re hopefully durable enough to last. This is the first page in my general notes section and is my “you’re leaving the house in 15 minutes, have you got everything you need?” list. Trust me, it’s not good to have your laptop in one county and your laptop’s charger in another! This is the first page of the thesis notes section, complete with scribbly 4am writing. I try not to take my work to bed with me, but sometimes it happens. You don’t get to see my diary because there’s too much personal stuff in there! I use it to keep track of where I’m supposed to be when – so meetings, research seminars, my various bits of paid work and deadlines as well as meeting up for coffee, reminders to buy cereal, eye appointments and so on. When I’m very busy it’s a relief to be able to write these down and not worry about forgetting them. The downside is that unless I write these down, I forget them. 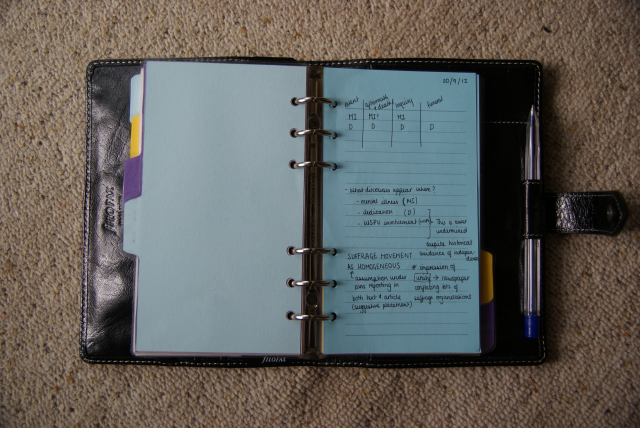 My organiser is pretty minimalistic compared to some – if you want a look at how other people organise their things, I recommend looking at Philofaxy and particularly their regular Reader Under the Spotlight profiles. Anyway, today I tried to do some work chasing up a reference. The library had it (yay!) but only through ebrary (boo!). Every so often I wonder if my resistance to ebrary is because I’m being a luddite and refusing to use something that will make my life much easier. Then I actually have to use ebrary and realise that no, I’m entirely justified in this. The above screenshot shows what it looks like on my monitor. I am deeply puzzled as to why the contents page needs to take up so much of the screen, leaving the text itself cramped to one side.To me this seems counter-intuitive – after all, I want to read the text – but what do I know, I’m only a researcher. You either have the choice of making the text bigger and easier to read OR having to scroll up every time you want to turn the page. It’s tedious. In conclusion, I don’t think it’s reading a book through a web interface that makes me cross, it’s the peculiar and inflexible design decisions that are making me cranky. Digital and online interfaces are all well and good, but good, thoughtful design is so important to make them usable. Recently I’ve been going to bike maintenance workshops. It’s been an interesting and often satisfying experience. There’s the comfort of knowing how to check your own bike for damage, how to mend punctures and how to be a more self-sufficient cyclist. There’s also a sense of satisfaction about doing something that has physical results, something that gets you covered in bike grease and dirt, something that requires you to work with your hands as well as your mind. There seem to be a few books out discussing the issue of working with one’s hands and the dangers of office work. It’s hard to write about this without romanticising manual work from a smug, clean fingernailed, academic stance, from the privileged stance of this being a choice for me, of this being as unnatural for me as Marie Antoinette playing milkmaid at her hameau. However, for me at least, there’s also a sense of responsibility; if I use something every day I should be able to understand how some aspects of it work, be able to fix some problems, know when I’m out of my depth. It gives me a better understanding of my tool’s capabilities and limitations. Does it make me a better corpus linguist? In some ways, yes – I built my desktop myself to a specification I designed for corpus linguistics. It’s skewed towards processing power and data storage, and light on the graphics. In other ways, not yet. While a computer is a bit more than a magic box for me, there’s still so much I don’t know about what it can do and how it works. 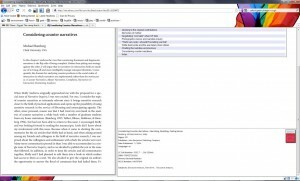 The more sensitive I become to how computers work, what they’re capable of, what they are incapable of, and the implications these have for investigating language use…well, it can only be a good thing, right? Bit of a ramble I’m afraid, I’ve caught some horrible student lurgy and am feeling a bit fuzzy-headed.